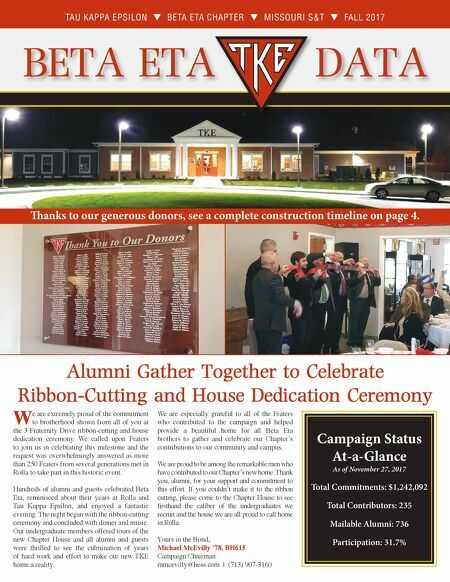 TAU KAPPA EPSILON q BETA ETA CHAPTER q MISSOURI S&T q FALL 2017 BETA ETA DATA W e are extremely proud of the commitment to brotherhood shown from all of you at the 3 Fraternity Drive ribbon-cutting and house dedication ceremony. We called upon Fraters to join us in celebrating this milestone and the request was overwhelmingly answered as more than 250 Fraters from several generations met in Rolla to take part in this historic event. Hundreds of alumni and guests celebrated Beta Eta, reminisced about their years at Rolla and Tau Kappa Epsilon, and enjoyed a fantastic evening. The night began with the ribbon-cutting ceremony and concluded with dinner and music. Our undergraduate members offered tours of the new Chapter House and all alumni and guests were thrilled to see the culmination of years of hard work and effort to make our new TKE home a reality. We are especially grateful to all of the Fraters who contributed to the campaign and helped provide a beautiful home for all Beta Eta brothers to gather and celebrate our Chapter's contributions to our community and campus. We are proud to be among the remarkable men who have contributed to our Chapter's new home. Thank you, alumni, for your support and commitment to this effort. If you couldn't make it to the ribbon cutting, please come to the Chapter House to see firsthand the caliber of the undergraduates we recruit and the house we are all proud to call home in Rolla. Yours in the Bond, Michael McEvilly '78, BH615 Campaign Chairman mmcevilly@hess.com | (713) 907-3160 Alumni Gather Together to Celebrate Ribbon-Cutting and House Dedication Ceremony Campaign Status At-a-Glance As of November 27, 2017 Total Commitments: $1,242,092 Total Contributors: 235 Mailable Alumni: 736 Participation: 31.7% anks to our generous donors, see a complete construction timeline on page 4.